We have all had that sinking feeling when we turn the key in our car and nothing happens. That is when having the best battery car charger in your car is a lifesaver. But which ones are the most reliable and how do they work? We take a look at the top ten chargers for your car on the market for 2019 and give you a rundown on their features, how they function and what you can expect out of each of them. We look at chargers that work with different types as well as what charger is needed depending on the size of your car battery. That is not the actual physical size, but the amp hours it will store and what size amp charger you would need to use for how long to charge your car battery with a charger. Choosing the right one does not have to give you a headache, our list of the top ten coupled with our buyer’s guide will ensure you get the right one for your needs. Ensuring your car battery is charged is essential due to the fact that many tire inflators require use of the cars’ battery. If your tires need inflating – you need the car battery! View the Best Battery Charger on the Market, Below. A fully automatic car 12 Volt car charger that is lightweight and compact and simple to use. This is so much more than a trickle charger, it is intelligent. It has a microprocessor that will ensure that it is always charged and ready to go whether it be your car, bike, ATV, RV, golf cart or any other similarly operated equipment such as generators. The Battery Tender is spark proof and reverse polarity protected. It is ideal for lead-acid, flooded or sealed maintenance free types or AGM’s and gel cell types. The two color LED will indicate what stage it is in. It offers a 12 inch output cord with an optional 25 foot cord sold separately, as well as a 5 year warranty. See more information on Battery Tender 021-0123. If you have battery operated equipment that is infrequently used and run the risk of depleting their life while they wait to be used then the thinking Battery Tender is definitely the one you need in your garage to ensure that you are never left without transport again. The professional’s choice in chargers and perfect for fleet operations, the Schumacher Charger can work on a wide range of different types including both 6 and 1 2 volt and comes with a cooling fan to ensuring top performance and a longer lifespan. Not only will the Schumacher boost it but it can also analyze any electrical and starting system issues which is a great benefit especially for professionals. It includes two rotary switches as well as a voltmeter. It offers three options, 200-amp quick charge which will revive completely dead ones quickly, 40-amp that revives your battery in 1 to 3 hours and lastly the 2-amp trickle charge which takes up to two to twelve hours to fill a small 12-volt battery. This is a manual wheeled that also offers battery clips for easy hook ups to your battery and is ideal for workshops, fleets and other commercial uses, as well as being at home in your garage. See more information on Schumacher SE-SE-4022 2. Every workshop needs this great product that offers a lot of additional features such as the ability to analyze electrical and starter issues as well as offering three different options. Not only great for fleet operations and workshops but also for the individual who has a number of different battery operated equipment they need to work on. A multifunctional offering that offers exceptional value for money the Black & Decker BM3B will allow you to test, fill and maintain your car batteries at the same time. They are suitable for use on 6 and 12 volt AGM, GEL, and WET types and are the perfect product for the professional as well as the individual home user. Connect in three different ways, using the vehicle battery using the battery clips which are included, via the O-ring terminals or the DC plug in your vehicle. The Black & Decker will ensure that you never end up with flat battery on your RV, antique classic car, motorbike, lawn mower or ATV and generator. In fact it will fill and maintain any battery operated equipment you have. The Black & Decker will monitor you’re their life and switch between modes going from charging mode to float or maintenance mode once your battery is fully charged thanks to its high-frequency smart technology. Built-in circuit protection protects your battery from overcharging, reverse polarity or short circuit. See more information on BLACK+DECKER BM3B. A great all-in-one charger that offers you the best of all worlds as it charges, maintains and checks them. Connect it up in three different ways and it charges both 6 and 12 volt. Built-in circuit protection offer peace of mind and it will work on AGM, GEL and WET types. Maintain and fill them effortlessly with the Battery Tender Plus. This product is temperature compensated which ensures you get the optimal voltage and it will automatically switch from full to float or maintenance charging mode when you battery is full. Battery Tender charger charges as fast if not faster than your 3-amp charger and offers reverse-polarity protection for peace of mind. Red and green indicator lights let you know the status. It also includes battery ring terminals and alligator clips for easy hook up to your battery. The Battery Tender Plus Battery 12 volt – 1.25-amp Charger is far better than a trickle charger as it is designed to revive your battery fully and then maintain it at the correct storage voltage without damaging your battery as a trickle may do. Perfect for people who have battery driven equipment that is not often used but need to be ready when needed. Maintaining and charging them has never been easier. 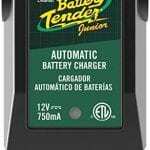 See more information on Battery Tender Plus 021-0128. If you are looking for a great charger that will revive them as fast if not faster than a standard 3-amp charger, and automatically switch to float or maintenance mode once your battery is full. Reverse polarity protection offers peace of mind. Keep them charged and maintained and ready to go always. An intelligent offering that will work for both 6 volt and 12 volt and maintain them once full. It will work for lead-acid ones up to 30 amp-hours and it will work twice as fast as a standard charger and if need be repair damaged ones. You can also use them with micro-hybrid start-up vehicles and CAMBUS electrical systems. State of the art technology gives you ultimate performance, this charger is compact and lightweight making it easily portable. They are impact, UV and water-resistant and will mount to all AC outlets. Connect using X-Connect battery clamps and eyelet terminals.The NOCO will not only bring your battery back to life it will monitor its activity and automatically switch to minimal consumption when the battery is full. It offers spark-proof technology and reverse polarity as well as overcharge protection for your peace of mind as you stay connected all the time. The LED indicators will indicate the status of your battery even when in maintenance mode. Comes with a 5 year limited warranty. See more information on NOCO Genius G750. Advanced technology allows you to bring your car back to life and maintain your battery with complete peace of mind with reverse polarity, overcharge protection and spark proof technology. See the status of your battery easily with the LED indicator lights and will work for both 6 and 12 volt lead-acid car batteries effortlessly. Give life to car batteries, deep-cycle, AGM or gel cell car batteries and maintain them at the same time with the Schumacher SC-1200A . This all-in-one charger offers a 12 amp rapid charger, 6 amp charger and 3 amp maintainer and its auto voltage detection will automatically detect if you are charging 6 or 12 volt and adjust accordingly. The Schumacher SC-1200A automatically switches from continuous to float mode so you can maintain your car, truck, RV or other large battery equipment. Not only that but it also has a slow option which is a trickle setting to accommodate smaller batteries such as ATV’s and lawn tractors. The built-n handle is sturdy and retractable and it doubles as a cord wrap for the 50 amp clamps and power cord. It is very lightweight weighing in at 3.1 pounds which adds to its portability. Comes with a 2 year warranty. See more information on Schumacher SC-1200A. A smart product that will automatically detect what voltage battery you are charging as well as change from continuous mode to float or maintenance mode automatically when your battery is full. Offers three different amp chargers and a slow or trickle for your smaller batteries. What sets this charger apart from others is the unique AC powered automatic charging accessory that you can use with all car batteries as well as small motorbikes to tractors and mowers as well as with cars, trucks and marine or deep cycle batteries. For you convenience the Schumacher SEM-1562A Battery Maintainer comes with a charger, jump cables and ring connectors. It will work for both 6 and 12 volt car batteries and changes from continuous to float mode to prevent overcharging automatically. The voltage detection feature allows the charger to know when it is connected to a 6 or 12 volt battery and adjust accordingly. The onboard microprocessor will analyze data provided and continues working until preset level and will then cease. It will transition into maintain mode and only deliver enough that is will raise the battery level should it fall. Offering additional features such as automatic temperature compensation, , thermal runaway reduces current if the battery is getting too hot and an auto-start feature which stops power from flowing through if there is no proper connection or there is a reverse hook-up. Finally it also offers a Desulphation mode for charging car batteries that are left discharged for long periods of time. See more information on Schumacher SEM-1562A. A feature packed product that offers everything you will need and more. Maintain your cars batteries and even recharge car batteries that have been left discharged for a long time. Exceptional safety features such as automatic volt detection, temperature compensation and thermal runaway which automatically detects if your battery is overheating and dials down the current accordingly. Plug in your charger and sit back and relax knowing that your Black & Decker will fill and maintain your battery without you having to change settings, select type of battery or do anything else. This completely automated fast charger with 3-stage charging will fill and maintain any AGM, GEL and WET 12 volt car batteries. Add to this the patented Engine Start Timer which will start up most vehicles in up to 8 minutes. You get a patented alternator check and battery voltage check that is available to view on your LCD screen which displays the information using icons that are easy to see and understand. Monitor not only your battery but your alternator at the same time, and it will alert you if your clamps are incorrectly connected. Not only will it ensure it is in working order and maintain your battery but it will work 40% faster than most conventional chargers. The Black & Decker BLACK+DECKER BC15BD is a completely worry free and a must have in every garage. See more information on BLACK+DECKER BC15BD. A completely automated chargers for charging and maintaining that gives you complete peace of mind, just plug it in and walk away allowing your battery to come back to life effortlessly. LCD screen to monitor you battery and alternator, know your status at all times. Start your engines in 8 minutes with the patented Engine Start Timer and more. Do your bit to save the planet while maintaining your battery with this ALLPOWERS Portable Solar. Using the power of the sun alone through the mono-crystalline silicone panel, you can maintain 12 volt car batteries with this charger that creates 5 watts of energy and an output current of 300mAh. Take this charger with you on your road trip and never get stuck with a flat battery again. The suction cups allow you to place it on the front screen of cars, it is lightweight and has a built-in blocking diode to prevent it from reverse discharging. The ALLPOWERS will maintain car, bike, tractor or boat batteries, in fact it will maintain any battery less than 18 volts. It is weather proof for extra durability. All you need to do to maintain you engine is to plug the solar charger into the cigarette lighter in your car or use the provided gorilla clips to attach it directly to the battery. In the kit you get a car solar chargers, car charger cigarette lighter plug and 1.5m power cord, battery charging clip line and 1.5m cord as well as 4 suction cups. See more information on ALLPOWERS Portable Solar. Not only can you bring it back to life and maintain your battery with the Optima Digital 400 but maximize its lifespan and performance with the built-in battery health mode. The Optima will work on any AGM battery, marine battery and motorcycle battery using spark-free connection technology. You can also revive discharged car batteries that a lot of other conventional chargers cannot even though that have fallen to 1.25 volts. Optima Chargers Digital 400 12V Performance Maintainer offers a hybrid LED charging gauge with an LCD screen so you can monitor your battery as it works. You can set you battery type using the quick-set feature for hassle free and easy operation. It offers a dual purpose hook and tilt stand design, or you can hang it on your wall using the wall organizer bracket that is included with the charger. A charger that can maintain your car batteries, and can even revive dead car batteries makes this a charger that you want to have in your garage at all times. See more information on Optima Digital 400 Maintainer. Charging, maintaining and even revive dead car batteries easily with the Optima Digital 400 chargers. You can monitor your cars batteries status with the built-in battery health mode which is included. Offering hybrid LED charging gauge, LCD screen and quick-set feature this is a must have charger in your garage. Knowing which car charger to buy and which is the best one to suit your specific needs can seem to be a little overwhelming. There are so many different types on the market and you without knowing exactly what you are looking for you can get a little lost. We try to demystify the car charger and give you the knowledge to be able to select the right one to use for your requirements. What is the Best one to use on your Car? The best car charger for your car or other similarly operated equipment will depend on the type and size. When talking about the size it refers to the amp hours it can store. If you have a 50 amp then the best charger, in this case, would be a 10 amp charger. It also depends on how fast the rate you want to be charging it, or if you just want to maintain the charging levels. What is the Best Portable car Battery Charger? When considering which portable car chargers to choose you should consider a few things. First, make sure that the charger is compatible with your car’s battery. Second, consider the charge time of the portable charger you are looking to buy. These will vary depending on the amp of the charger and the amp of your vehicle. Portable chargers are meant to be there for you in an emergency so getting a portable charger that only puts out a trickle and will not be helpful if you are stuck at the side of the road with a flat battery. Also, consider getting a portable charger that will also alert you to a problem with your battery so that you can take the necessary steps to correct it before you get stuck again. It is also worth reading this study on the possibility of universal car batteries of this nature, by clicking here. Can you Leave a car Battery Charger on too Long? You could damage them if they remain continuously connected even at very minuscule 2 amps. If you want to leave your car charger connected for long periods then it would be best to get an intelligent car charger that will turn itself off when your battery is full and only switch itself on again when the level it falls to low enough level to require a top up. Yes, they do work, but they are not as powerful as some of the other car battery chargers and generally put out a lower amperage, making them perfect as trickle or maintainers. They usually come with a cigarette lighter socket adapter and some, like the ALLPOWERS Portable Solar charger – they come with both the gorilla clamps and the cigarette lighter socket adapter. Basically, they work by using the energy from the sun to create electricity that it can store. They will use a photovoltaic solar panel to collect this energy and store it. They will usually only put out between 500 and 1500mA. This is enough to create a trickle charge which will work albeit at a slow rate. How to use Car Battery Charger amp Meter? The amp meter on a car battery charger will show the basics such as if it is charging and what rate the car charger is putting out the amps. You will have to connect the charger to it in order to get an amp reading. The amp setting on chargers will allow you to select how fast or slow you wish to charge your battery (click here to read the study, and what happens when you charge! ), the lower the amperage the slower it will charge and this low setting will allow you to maintain your battery. How Long do car Chargers Take to Charge? If you jump start your car using one of these great battery chargers and then use the alternator for charging it up as you drive with your car then the process takes about an hour to get the battery full. Using a car battery charger to charge it can take longer and will depend on the number of amps your charger puts out. Charging time can vary from 1 to 3 hours depending on the amperage and if you are going to be using a trickle charge then the time to charge up fully will be substantially more. The BLACK & DECKER BC15BD offers a patented engine start that will get you back on the road in 8 minutes. Being able to have a means of charging your vehicle when it is flat is a necessity. Having one that can maintain it so you are never left out in the cold with an automobile that won’t start, or when you finally get the change to take your boat out on the water but the motor is dead is not a nice feeling. Having a charger that will maintain it life on seldom used battery operated vehicles or being able to charge it in a jiffy so you are not late for work is something everybody wants to be able to do. An intelligent car battery charger that will charge any of your vehicles or equipment that need charging and offers four modes including a float or maintenance mode. It is lightweight and compact as well as very simple to use. The microprocessor allows you to ensure that it is always ready to go when you need it. This great car battery charger will monitor your car batteries charge levels and when it has reached a capacity charge will switch to a float or maintenance mode and will only switch itself on again if the car batteries charge level falls to a certain level. This prevents overcharging it and damaging it. It offers safety features such as reverse polarity protection and is spark roof. The LED lights indicate the state of charge of it so you can see if you are good to go or not. With lots of features, this 12 volt car battery charger offers more than just a trickle charge and it is for this reason the Battery Tender 021-0123 is our best choice of all the car battery charger on our best rated top ten list. This is the best car battery charger to use for fleet operations or in a workshop. The car battery charger offers the ability to charge a wide range of car batteries including both 6 volt and 12 volt batteries. It offers a cooling fan which will not only extend the lifespan on your car battery charger but ensure the best performance from it. It will not only charge your battery but analyze it and let you know if there is any electrical or starting system issues you need to address and it includes two rotary switches as well as a voltmeter. Offering a 200-amp quick charge to get you on the road quickly or to charge a battery that has completely depleted, a 40-amp charger that will recharge your battery in between one and three hours and then the 2-amp trickle charge to maintain your battery at acceptable levels at all time. A manual wheeled car battery charger that offers easy hook ups to your car battery and is great for commercial workshops and in fleets but is just at home in your own garage, this is what makes the Schumacher SE our premium choice on our best list of top car battery chargers. A feature packed car battery charger that will not only charge and maintain your car battery or any other similarly operated vehicles or equipment such as generators or lawn mowers that need charging, it will also test the life it has left in it and let you know if there are problems. The Black & Decker can be used on both 6 and 12 volt car batteries and will work with AGM, GEL and WET batteries. You are able to connect your Black & Decker charger in three ways, via clips, O-rings terminals as well as using the DC plug in your vehicle. This is a fully automatic car battery charger that will monitor your car batteries (click here for a study) and switch between modes going from charging to float or maintenance mode depending on how full it is. Offering safety features to protect it from reverse polarity, overcharging or short circuit in the form of a built-in circuit protection. All these great features along with the power to bring your battery back to life quickly and efficiently and a great price make the BLACK & DECKER BM3B our great value pick from our list of top ten car chargers on the market in 2019. We hope you enjoyed our article on "The 10 Best Battery Chargers for Cars in 2019", if so, please share and rate it. Great review on battery chargers, was looking for a battery charger that would jump start and would have different charging setting to use and also test batteries too, so in the end, I went for the Schumacher SE-4022 2/10/40/200 Amp Manual Wheeled Battery Charger and Tester so thank you for the help.